Dear Lord heavenly Father, thank you for a faith based on truth and faith in Christ and in your word. Thank you for protecting our hearts from wandering into endless myths and fanciful superstitions. There is no limit to what the human mind can conjure up. There is no limit to what we are tempted to worship. Even in Revelation 19, we are warned not to worship angels. But you keep our hearts focused on Jesus and the Gospel. Jesus is the way, the truth and life. You are the light of the world. Those who believe in you will never walk in darkness but have the light of life. In you there are clear limits and bounds, almost like the constitution of the Kingdom of God, that actually release our hearts and minds to imagine and dream great things. You guide us along the right path to eternal life. Lord, me and the people of our land hold onto the way, the truth and the life, Jesus. Guard our hearts by your truth and your spirit. Release us to have great vision for the future. Help me to accept your word in my heart today. I pray in the illuminating name of Jesus Christ. Amen! Part 1: The Rider On The White Horse (11-16). The rider on the white horse is Jesus. He is faithful and true. He will judge and destroy all unrighteousness and give his people victory. When he comes again, his eyes will be ablaze with the fire of judgment. He will wear many crowns for he has destroyed all dominion, authority and power and put them under his feet. (1 Cor 15:24) He is dressed in a robe dipped in the blood of the Lamb that has power to save. His name is the Word of God, which gives eternal life. (John 6:68) Out of his mouth comes a sharp sword which penetrates soul and spirit. 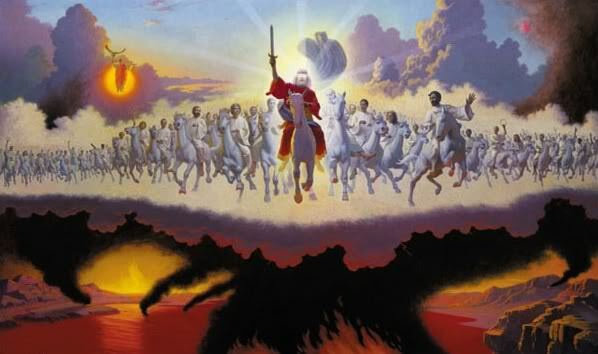 (Heb 4:12) With his word, he strikes down all rebellious nations. He executes God’s wrath on the nations of the world. He is King of kings and Lord of lords. This says it all. Today Jesus comes to people as a gentle shepherd and friend. He is gently whispering to every heart, to draw near to him and place their faith in him. This is our Jesus, the king riding on a donkey, the good shepherd who lays down his life for the sheep. He is the gentle God who calms our hearts at night and guides us throughout the day…Jesus…The Good Shepherd. But one day Jesus will come again. When he comes he will not come as the gentle, humble and lowly shepherd of the sheep. He will come in all of his glory to be the judge of the living and the dead. He will come as this passage describes him. The word of God is like a sword, not a cotton ball. We need to perk our hearts and take heed. We need to have a healthy fear of God in our hearts. We need to draw near to Jesus and be found in him and rest in his all sufficient grace and salvation. We need to let others know about this Jesus and the way to be saved, which is through faith. Jesus did not just come to this world to save us from our emotional needs and our relationship needs while living in this world. He did not just come to show us how to live a better and happier life in this world. He did not just come to show us the most fruitful and meaningful way to live our lives in this world. He does show us these things and more. But he mostly came to save us from judgment and eternal condemnation that come because of sin. He came so that we may be forgiven and when we pass from this world to the next, we may enter into eternal glory with Jesus and the church of God, forever and ever. Jesus came to bring about the triple cure, saving us from sin, death and hell. That is the best reason as to why the Gospel is Good News! I pray that I may stick to the Gospel as the Bible presents it and share the Gospel with the world. Part 2: The Beast And False Prophet Wage War (17-21). The devil’s forces are bent on rebellion. But they can not defeat Christ and his forces. They may try and try but in the end, Jesus will throw the beast and his prophet into the fiery lake of burning sulfur. Then those who were deluded by the beast and the false prophet will be destroyed by the sword of the Lord with no one to bury them. This is complete and utter failure by all forces that appose Christ. The best thing that anyone can do is on board with the Gospel. We need join with Jesus and his cause, the Gospel cause. This begins with confession of sin, repentance and placing all of our hope, faith and trust in what Jesus has done for us. Jesus helps us to mature in our faith and in our relationship with him and we find the Missio Dei for our lives and our families and ministries. We because a member of the Kingdom of God. Then we can know for certain that we will never be one of those unburied ones on Armageddon’s battle ground. We will never be one of those who receive the same judgment as the devil. We will be saved to the uttermost and be a member of Jesus’ triumphant kingdom. Prayer: Lord, you are my Faithful and True King. Help me to wait on your coming and believe the final victory is yours and be part of the triumphant Kingdom of God by faith. « Thanking God for granting us stamina and strength to bear up in a hard world.